Fast growing and free-blooming, this splendid flower graces the garden with glossy green, very attractive foliage and scarlet flowers with black button centers. 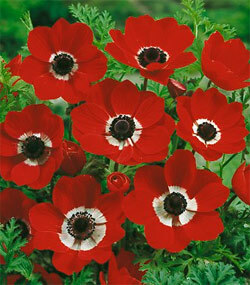 Also know as poppy anemone, it grows 8-10 inches tall, is an excellent cut flower and superb in containers. Plantings attract butterflies and deer leave them alone.